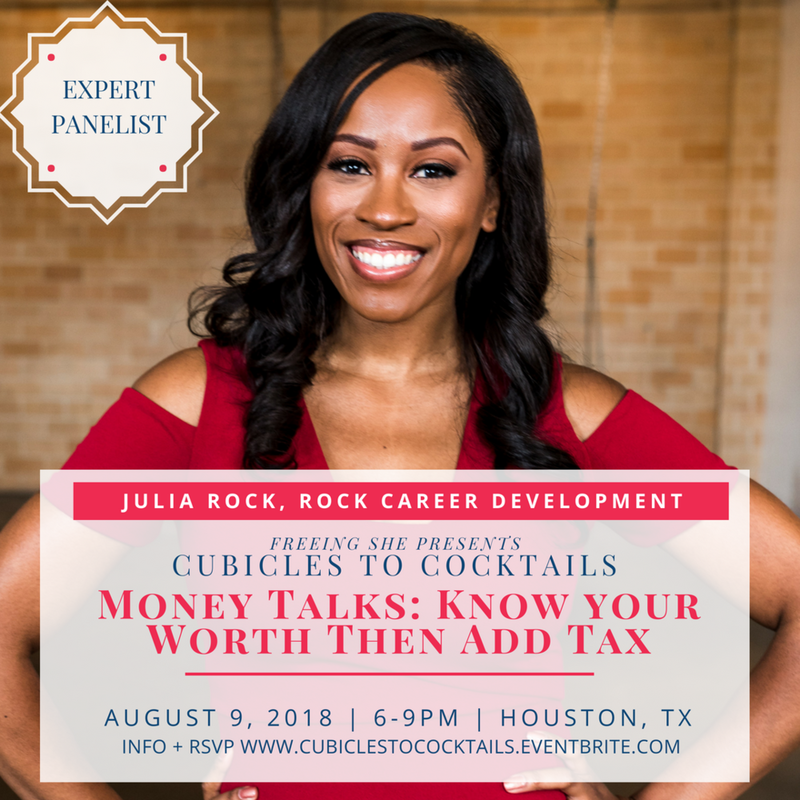 Join Houston's success-minded women of color for cocktails and conversation about Earning Your Worth plus Tax! We are bringing in corporate and entrepreneurial experts to answer all your questions about asking for a raise, determining your market value, and strategies to build generational wealth as a modern woman AND MORE. Let’s dismantle money mindsets holding us back from realizing our true value and do something about earning our worth as multicultural women of color! 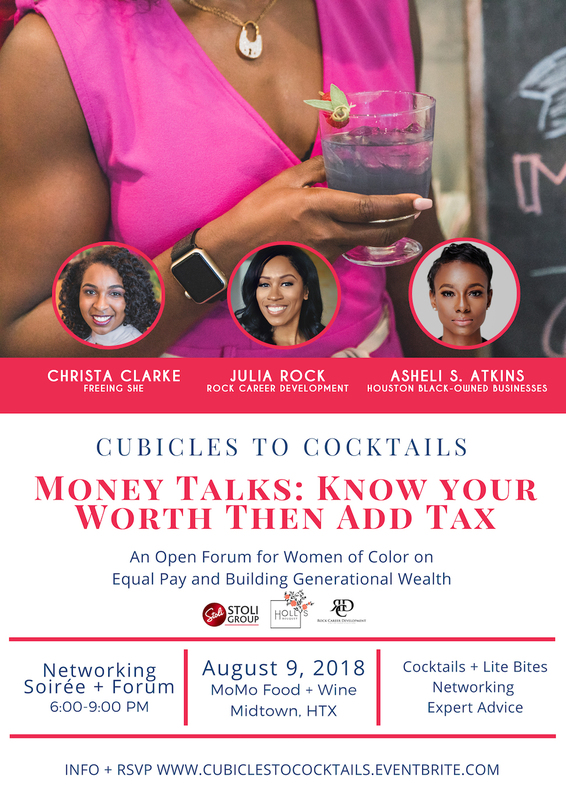 At the upcoming Cubicles to Cocktails soirée, we are discussing money mindsets, equal pay, and building generational wealth. Christa Clarke is a project manager specializing in healthcare operations and curriculum development. She is the Founder + Chief Creator of Freeing She and Host of Cubicles to Cocktails. Christa started Freeing She with the intention to provide women the tools and resources to flourish in their careers + life. Julia Rock is a certified professional resume writer, employment interview professional, and career consultant. She is also a finance and accounting professional with international experience. Julia launched Rock Career Development to help job seekers and career changers take the guesswork out of the job search process and reach their career goals. Asheli Atkins is an instructor, entrepreneur, researcher and 3rd year Ph.D. student at Texas A&M University. In her research, she studies the strategies African American entrepreneurs use to navigate discrimination and racial barriers in the market. 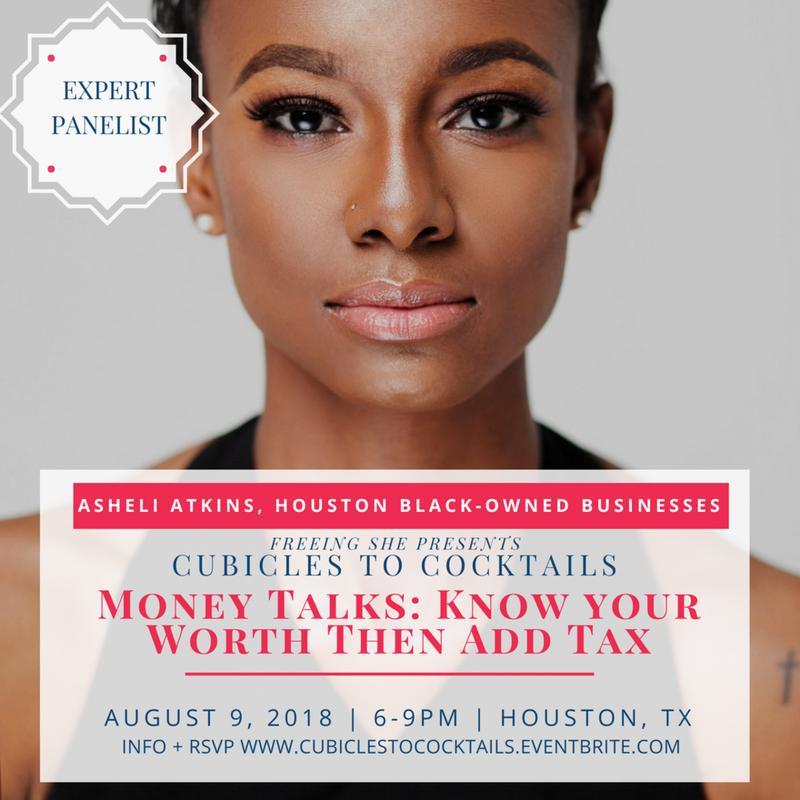 Asheli the Founder of Houston Black-Owned Businesses (@HouBlkBus) a social media platform used to highlight and inform Black entrepreneurs in the Houston area. Rock Career Development— A boutique career services firm based in Houston, TX that delivers results on the job search and career enhancement needs of clients across the nation. Stoli Group—Mainly known for the Stolichnaya® Vodka brand, Stoli Group has expanded it’s portfolio in recent years to appeal to the premium on-premise and a more sophisticated global consumer. Holly's Bouquet— A family operated floral design company. They are Houston-based floral creatives, who specializes in custom floral art, events, and company branding opportunities.